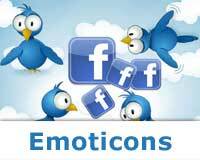 Here are some of the cool and interesting emoticons for Twitter and Facebook. These are just the symbols and can be used very easily. You just need to select the emoticon you like and copy that symbol and paste it on the Twitter wall or the Facebook wall. No Comment to " Twitter and Facebook Emoticons "